After much research I finally ordered a helmet cam setup. I bought a KT@C Sony 520 line helmet cam and a RCA Lyra X2400 digital recorder. The Sony cam isn’t the best camera out there but it should produce decent results and handle the challenging conditions I am going to put it through. The RCA Lyra X2400 digital recorder records direct to SD cards. I think this should work out best for ease of use and all the vibration & shock it is going to receive. No hard drive to crash and no tapes to mess with. If you are looking to get a helmet cam setup, check out this helmetcamreview.com . They have side by side comparisons of the most popular brands. Very informative site. Hopefully the weather will clear up so I can hit the trails soon! It has been raining almost every day for 2 weeks! It is going to take a while before the trails dry out. I found some really cool motorcycle videos on YouTube and integrated them into TxTracks.com. Everything from crash videos, amazing trials riding and vintage Evel Knievel footage. Some of those crashes Evel had on that big heavy Harley were really nasty! There is even a video of his snake river rocket bike jump. Now that is pretty darn funny. Amazing he didn’t get killed in that one. I finally updated the UI on TxTracks.com. It is a clean simple design. Hopefully people will find it easy to navigate and little more pleasing to the eye. It should be all XHTML compliant. It is amazing the things you can do with all of the cool new web API’s. Lots of fun to play with. 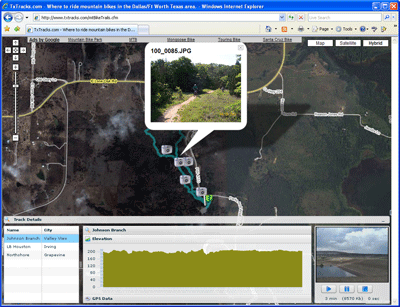 Here is a screen shot of the latest version of the Mt Bike Trails UI of TxTracks.com. It is a combination of Flex & Google maps. All photos are served from Flickr and videos are served from YouTube. Can’t wait for the weather to clear up so I can get some more data in the app and launch this!